The QCA Spas Dream Weaver seats up to 7 people. Luxurious quantity of jets (53 jets) along with LED lighting at an affordable price. Comes with polar insulation and a lockable hard cover. Contact us to find out if we have free delivery to your area. 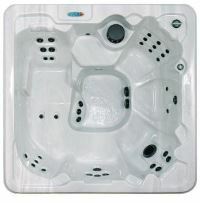 Dream Weaver 7 person hot tub by QCA Spas features 53 jets operated by 2 hi flow jet pumps. Includes a wrap-around lounger and LED lighting! 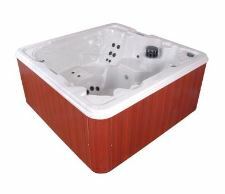 When you buy a Dream Weaver hot tub from QCA Spas , you can feel confident knowing your spa is backed by one of the most trusted U.S. spa manufacturers with over 47 years of experience. The Dream Weaver spa seats up to 7 people and is powered by 2 independent hi-flow jet pumps for a more invigorating massage. Dream Weaver comes with a hard cover included and you can get a replacement Dream Weaver hard cover online at Hot Tub Outpost. You will love the innovative features and eye catching design of the Dream Weaver- including the wrap around lounger. 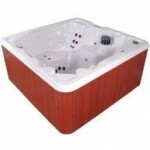 Get the best deal online on a QCA Spas Dream Weaver Model 4L. This spa is also available in a non-lounger version (DreamWeaver NL). The spa shell is built with Lucite ABS-backed Acrylic and features Microban protection – an industry first providing continuous antimicrobial protection. The spa is powered by 2 x 4 HP Hi-Flow Pumps with different speeds. Industry standard Balboa topside electronic controls and a 4 kw heater are included. Spa includes a factory hard cover with tie down straps and cover locks. Choose from Blue Denim or Sterling Silver Marble colors. Cabinet comes in redwood/PVC color and features reversable and removable side panels all around for easy access. This high quality spa cabinet is built around a solid galvanized steel frame for long-lasting durability. (10) Dual corner adjustable back jets configured both mini massage and directional. Balboa electronic topside control for ultimate reliability. A four-button Soft Touch™ control for your pumps, temperature, and light. The Soft Touch™ pad also features LED temperature diagnostic read-outs. Dura-Bond™ four layer strengthening process combines high density material that is reinforced with a fibrous chop that yields superior strength to the spa’s shell. This exclusive strengthening system produces no VOC’s (Volatile Organic Compounds); a harmful emission that can affect the environment and human health. Contoured multi-level seating, walk-in steps and plenty of space for your feet are added touches that will make you want to spend every day in this popular QCA Spa. Add the Aquapure Ozonator system and get even cleaner, clearer water with reduced maintenance. If you read this far and are interested in this spa, contact us for a special code that will give you an extra discount on the spa (-$100 along with a free ozonator). Get the party started with your discount Dream Weaver spa shipped free to any location within the continental United States.